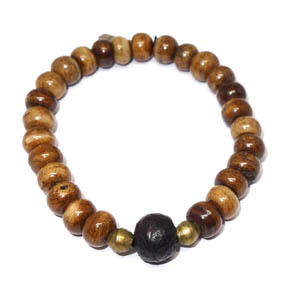 This bracelet features hand-carved 10mm bone beads and small brass spacers centered around a hand-carved 13mm tibetan wood bead. Bracelet is claspless, strung on an elastic cord. 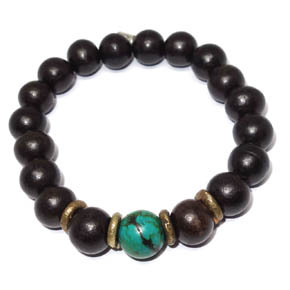 This hand-carved bead bracelet features 11mm ebony wood beads and brass roundels surrounding a 12mm turquoise center bead. Bracelet is claspless and strung on an elastic cord. 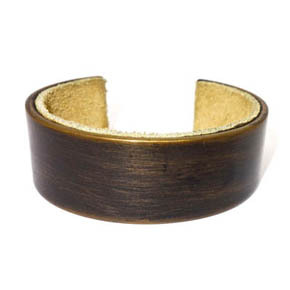 This handsome (large) brass cuff is fitted with a soft suede interior. Cuff measures 26mm in width. Also available in 10mm (small) and 20mm (medium) sizes to fit your preference. 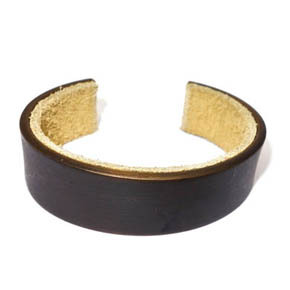 This handsome (medium) brass cuff is fitted with a soft suede interior. Cuff measures 20mm in width. Also available in 10mm (small) and 26mm (large) sizes to fit your preference. 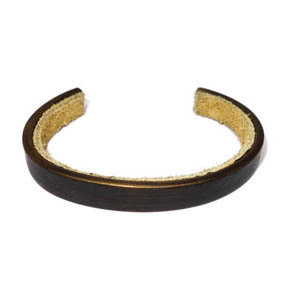 This handsome (small) brass cuff is fitted with a soft suede interior. Cuff measures 10mm in width. Also available in 20mm (medium) and 26mm (large) sizes to fit your preference. 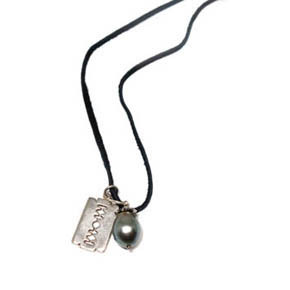 This unique necklace features a South Sea pearl, diamonds, and a sterling silver razorblade pendant on 30" leather strap. South sea pearl pendant measures 15mm x 11mm, razorblade pendant measures 21mm x 14mm. 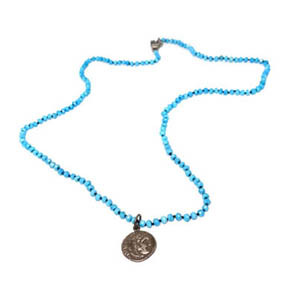 This hand knotted necklace is strung with 3mm turquoise beads and a sterling silver Alexander the Great repro coin pendant. Necklace measures 25" in length. 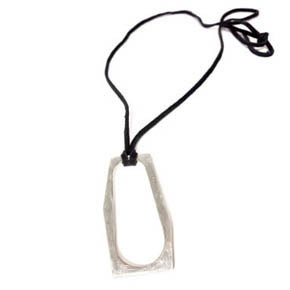 This 2.5" x 1 1/4" sterling silver pendant is strung on a 30" leather cord. 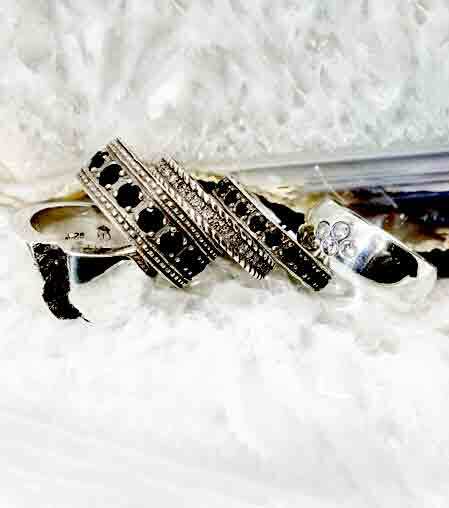 As well as making a stylish necklace, the pendant also doubles as a unique 3 finger ring. 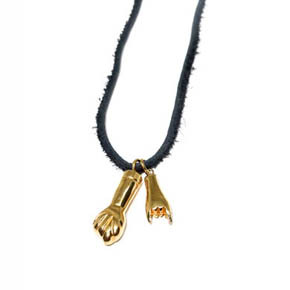 The Mano Cornuto (Horn Hand) and Mano Fico (Fig Hand) are ancient Italian symbols of good luck. Meant to ward off the evil eye and protect the wearer from harm, these pendants paired together are the ultimate protection. Both pendants are made of brass and are strung on a 30" leather strap. Mano Cornuto pendant measures 23mm x 9mm and the Mano Fico pendant measures 30mm x 11mm. 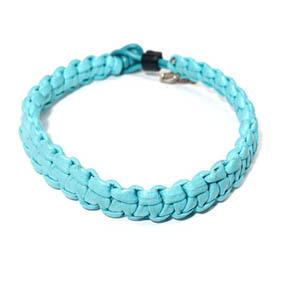 This sterling silver & turquoise woven leather men's bracelet is made for a size 8.5" wrist. 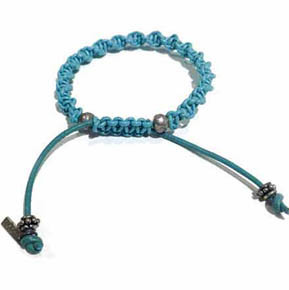 These handmade turquoise leather bracelets feature high quality macrame leather. 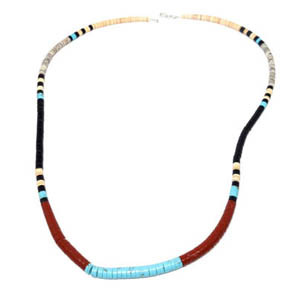 This hei-shi inspired necklace features beads made from turquoise, agate, and shell. Beads range in size from 4mm-6mm. 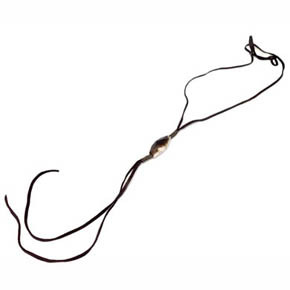 This leather lariat style necklace features a 34mm x 16mm agate stone bead. Sizes of stone vary, necklace has a 36" neckline and 11" fringe. 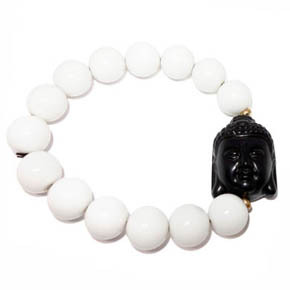 This zen bracelet features 12mm white agate beads framing a 21mm x 29mm x 13mm black agate buddha head. Bracelet measures 7" in length. Featuring 6mm white agate and 6mm lava beads, this black and white bracelet gives off a very Yin and Yang vibe. 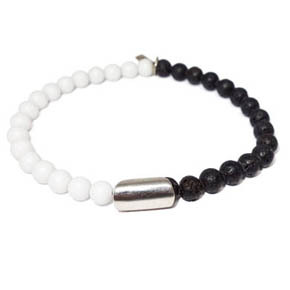 This bracelet is fitted with a sterling silver detail bead that separates the two sides. 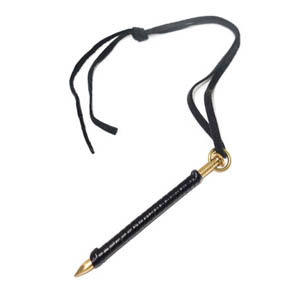 This necklace features a 4 inch brass nail pendant wrapped in leather strung on a 30" leather cord. This bracelet is strung with 10mm x 9mm carved red ceramic beads surrounding a sterling silver frame with a 15mm x 22mm turquoise inlay. 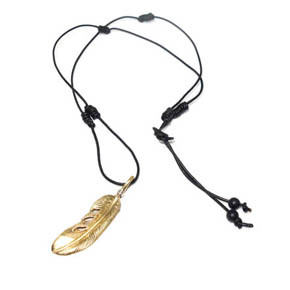 This charming 34 inch knotted leather necklace features a 56mm x 14mm brass feather pendant with sterling silver detailing and an adjustable closure. 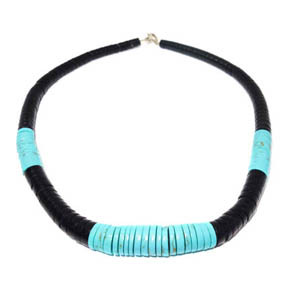 This hei-shi style peacepipe necklace is made from turquoise beads and silver accents. 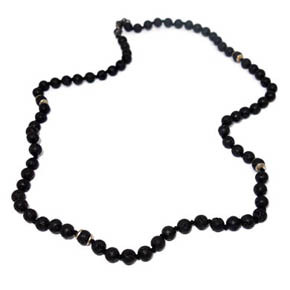 Necklace measures 18 inches in length and beads measure 5mm-12mm. This 19 inch bracelet was designed to be worn wrapped twice around the wrist. 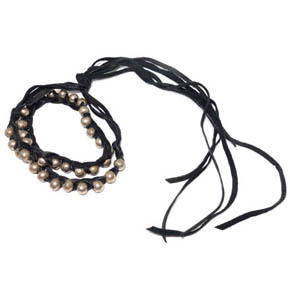 Adorned with 8mm brass beads and a leather tassel, this bracelet is true Lazaro style. 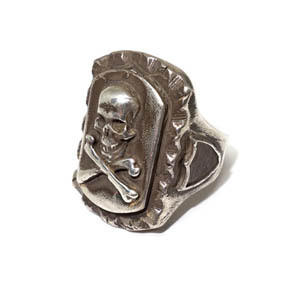 This remarkably intricate 9mm sterling silver ring features hand carved crosses and stunning attention to detail. This ring would make a great every day accessory, wedding band, or gift for confirmation, graduation, and other religious celebrations. Size 9. 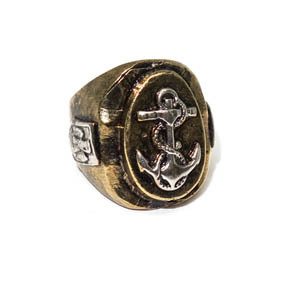 Reminiscent of a vintage diving suit, this hand-carved brass anchor ring by HTC has a slightly antique aesthetic. Ring is size 10 and measures 19mm x 6mm. 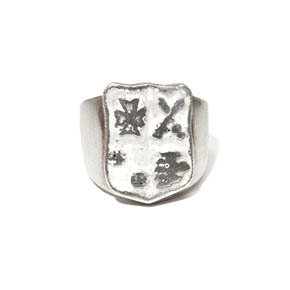 Inspired by a medieval coat of arms, this sterling silver and enamel crest is truly unique in style. Ring is size 10.5 and measures 20mm x 8mm. 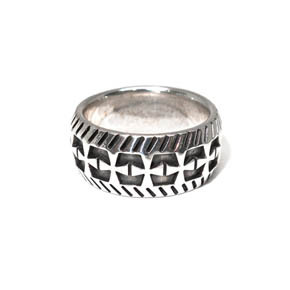 Crafted to resemble a razor blade, this bold sterling silver ring is crafted for daring jewelry trend-setters. All the charm of the design, with no sharp edges. Ring measures 23mm x 14mm and is size 10. 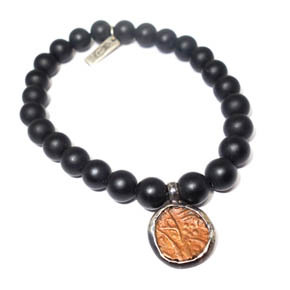 This stunning bracelet features 8mm onyx beads and a 16mm ancient coin strung on an elastic cord. The claspless design makes this bracelet perfect for everyday wear as it can be slipped on and off with ease. 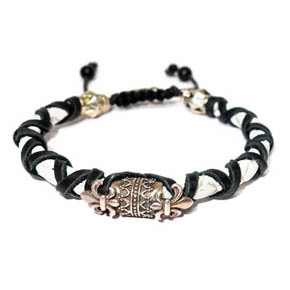 This braided 5mm black and white leather bracelet features hand-carved brass fleur de lis beads. Fitted with an adjustable closure for comfortability, simply pull and slide the closure for a customised fit. 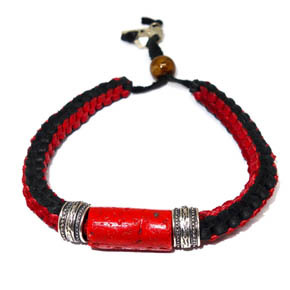 This 7mm bracelet is crafted from hand-dyed red, green, and black leather and sterling silver spacer beads. This bracelet is fully adjustable, just tug on the end cords to fit this bracelet to your preferred size. 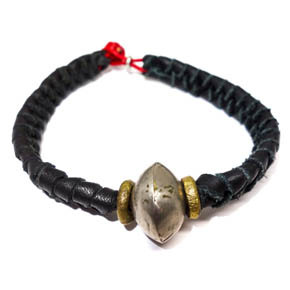 This bracelet, while simple in design, is anything but ordinary. 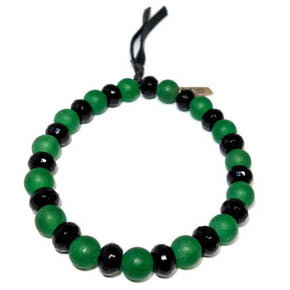 Featuring 8mm hand-carved green and black onyx beads, this duo can't be beat. Green onyx is closely associated with the zodiac signs of Gemini and Virgo but is also known to help people assert authority, build confidence, and stimulate memory. 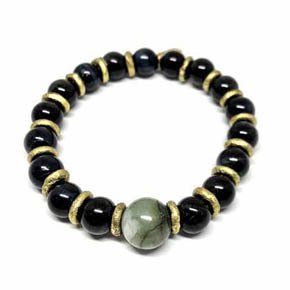 Black onyx has been said to assist in opening the chakras to allow an increased flow of positive energies. 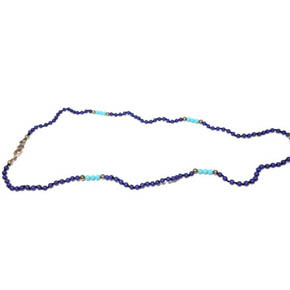 This beaded necklace features 3-4mm round beads made from lapis, reconstructed turquoise and sterling silver. Necklace measures 22" in length. 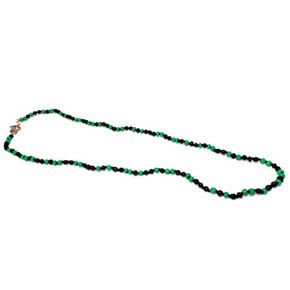 This hand-knotted cord is adorned with small malachite beads to give the necklace a chain-like effect. 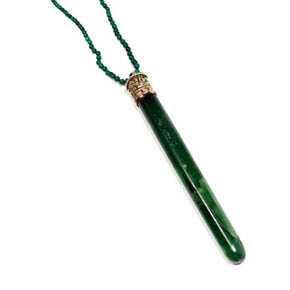 The 85mm x10mm jade pendant is affixed to the necklace with a brass cap bead. 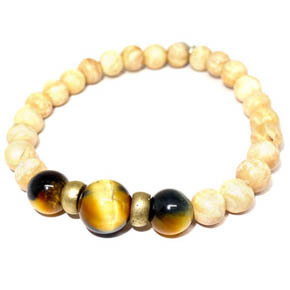 This bracelet features 8mm conch shell beads and brass spacers paired with 12mm tiger's eye beads. This stunning piece has a nature inspired look and it perfect for everyday wear or to give as a gift. This striking green and black necklace is crafted with 4mm ceramic beads on a 24" hand-knotted cord. Affixed with a sterling silver clasp. 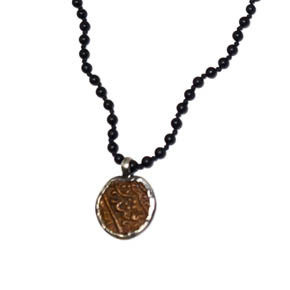 This stunning necklace features an 18mm ancient brass coin pendant on a hand knotted onyx chain. 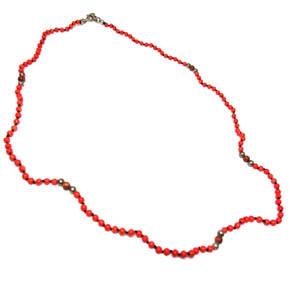 Refresh and revitilize your mind with this dazzling red necklace. 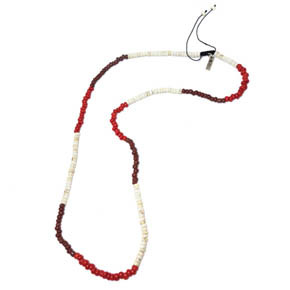 Features include 3mm beads strung on a 24" hand-knotted cord. The beads are crafted from reconstructed coral, sterling silver, and sunstone. 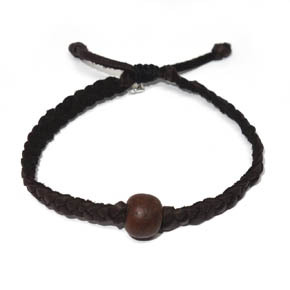 This charming bracelet features a 13.5mm white brass bead neighbored by two smaller 9mm brass beads on a 10mm braided leather band. 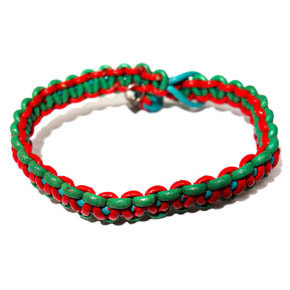 Affixed with a thread closure, this bracelet doesn't involve any difficult or bulky clasps. This darkly beautiful woven leather necklace features a 22mm x 18mm jet skull closure. 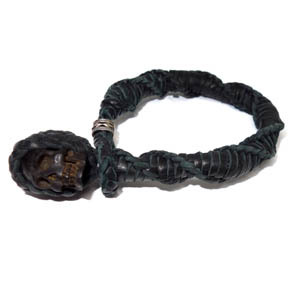 This bracelet is perfect for anyone who enjoys macabre or skull inspired jewelry. 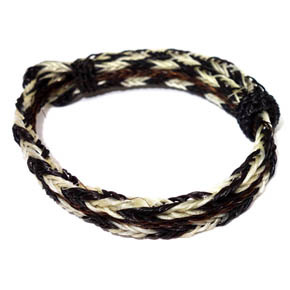 This black and white braided horsehair bracelet measures 9mm in width and has an adjustable closure at the back. This piece would make a great gift for any nature lover or equestrian lover. 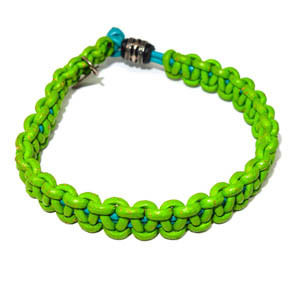 This 10mm vibrant green and blue leather bracelet is affixed with a sliding bead closure. The bead is hand-carved sterling silver. This charming mabe pearl necklace is quite unique. 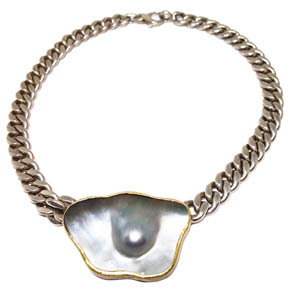 The 32mm x 47mm pearl is with an 18kt gold bezel and is featured on a 10mm wide chain. Most mabe pearls are shaved down to just the area of the pearl, but this piece was left with some of the shell area for a distinctive shape you won't find anywhere else. 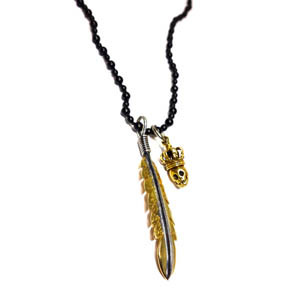 This ornate necklace features feather and skull pendants hand crafted from sterling silver and brass. Feather pendant measures 64mm x 11mm and skull pendant measures 17mm x 10mm. Pendants are strung on a 24" hand-knotted onyx chain. 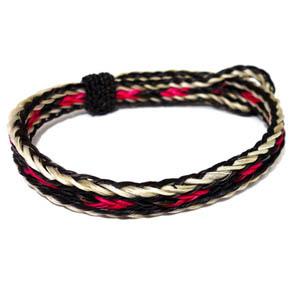 This 9mm wide braided bracelet features hand-dyed horsehair and an adjustable closure. 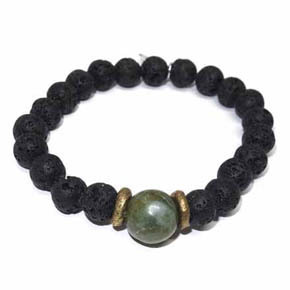 Simple style and natural colors come together in this nature-inspired bracelet. 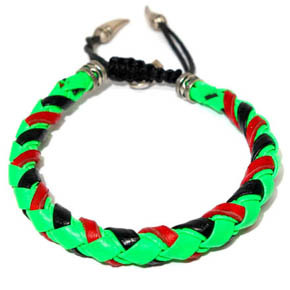 This woven green & red leather bracelet measures 9mm wide and features an adjustable clasp for comfortability. 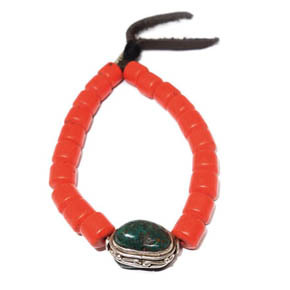 This bracelet has bold colors and a sleek look, perfect for everyday wear. This woven bracelet features 7mm ceramic, sterling silver, and brass beads strung on a woven bracelet. 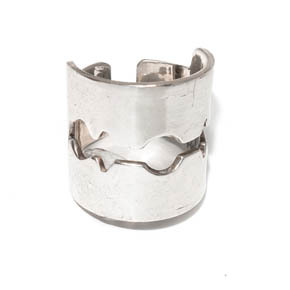 With a sliding closure, you can tighten or loosen this bracelet to fit you perfectly. 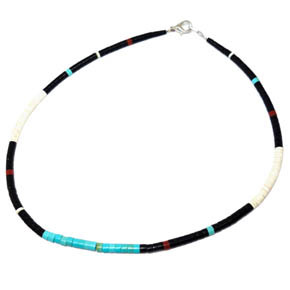 This simple yet stylish necklace features 4mm rounded beads crafted from turquoise, shell, coral, and ceramic. The natural color scheme of the beads makes this necklace perfect for pairing with almost any outfit. 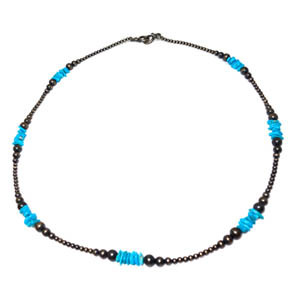 This 23" necklace features vibrant 3mm-5mm sterling silver and turquoise beads strung on cord. Created with an earthy and naturistic vibe, this necklace is the perfect gift for yourself or that nature lover in your life.